From the day we are born our bone structure, which consists of living and non-living substances, grows with us in a process called ossification. We are vertebrates with internal skeletons and it is how all vertebrate species grow. But not all living organisms grow in this way. Take for instance some invertebrate snail species in the Phylum Mollusca. Invertebrates, which include insects, crustacea and mollusks have external skeletons. The external skeleton of a mollusk is its shell, composted strictly of non-living substances, mostly calcium carbonate. Now that we’ve cleared up the basic science lingo, let’s look at a group of living organisms that defy the concept of retaining bone structure from birth. Spire truncation in Urocoptidae. Anoma splendens endemic to Jamaica showing spire truncation, and at right, a living specimen with the spire intact. Photo: Richard L. Goldberg © 2011. 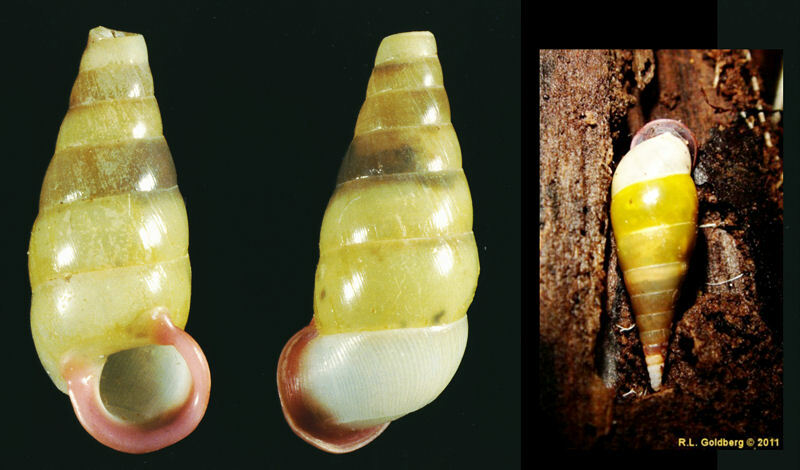 Most species in the land snail Family Urocoptidae lose the early part of their shell growth in a process referred to as “spire truncation”. In other words, as the snail grows, it adds whorls to its shell, but in doing so eventually loses the thin and fragile early spire growth of its external skeleton. This does not hurt or harm the shell. At a predetermined point the snail will plug or fill in the shell at the point of truncation with shell material. When the early whorls finally fall off, the shell is sealed off on top. Truncated Jamaican Urocoptis. An adult specimen in the genus Urocoptis with its early spire whorls truncated. Size about 20mm in length. Photo: Richard L. Goldberg. © 2010. 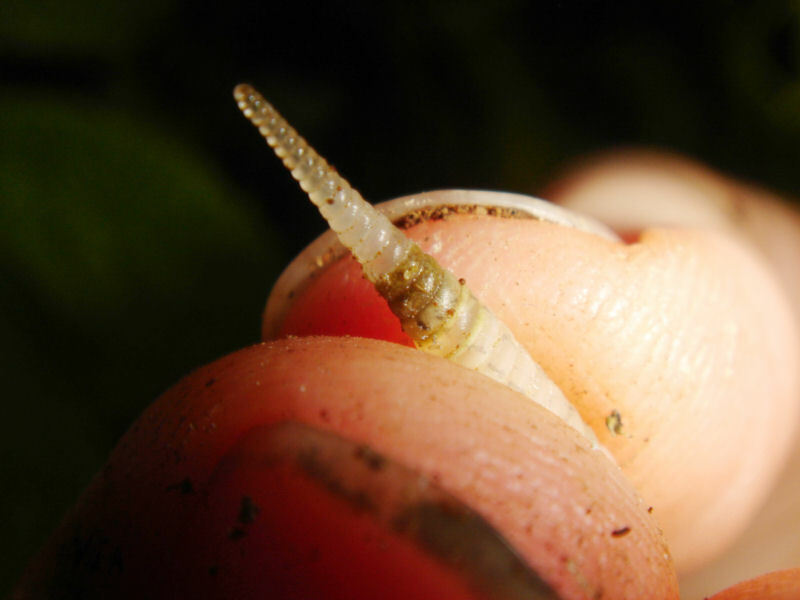 Urocoptids are Pulmonte (air breathing) snails found only in the tropical climates of the Western Hemisphere. In Jamaica 73 Urocoptid species in nine genera are recognized by taxonomists. All but one are endemic [only known] from Jamaica. Each species inhabits a limited area of the island. The smallest species grows to under 10mm, or a ¼ of an inch. The largest exceeds 25mm or one inch. All species sans one truncates its early spire whorls as it grows. 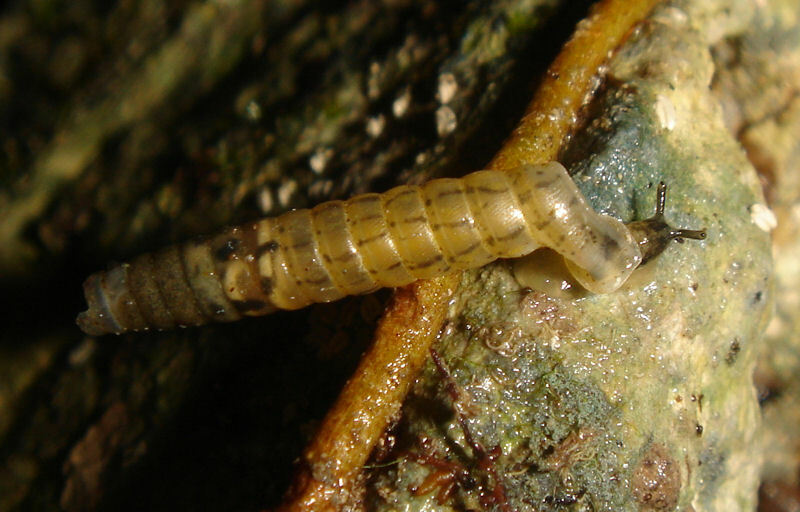 An adult Urocoptid, Mychostoma alba, crawling on a wet limestone outcrop in Jamaica. Note truncate spire. 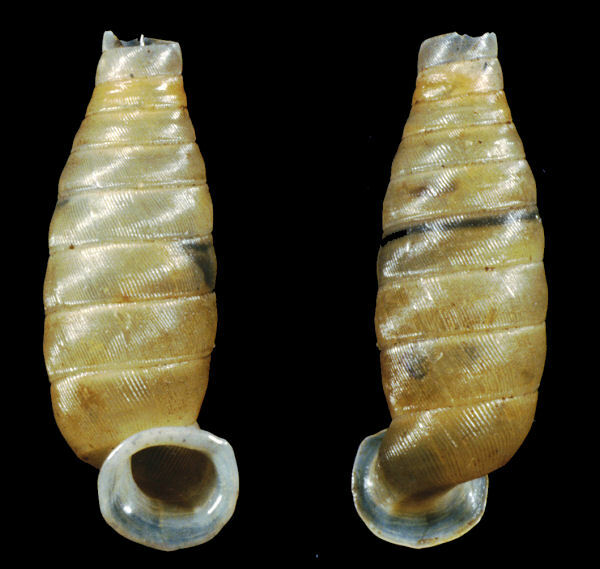 Shell length about 9mm. Photo: Richard L. Goldberg. © 2012. Over the past couple of weeks while exploring the rural and remote forests of Jamaica Dr. Stephanie Clark, Director of “Invertebrate Identification Australasia”, who has joined us in the field for some research, discovered a population of Mychostoma alba, one of the smaller species of Jamaican Urocoptids. These calciphiles or limestone dwellers can be found in leaf litter at the base of limestone cliff faces and outcrops and during rains and at night, attached and crawling on the limestone cliff faces. The very small yellowish needle-like shells are at first almost camouflaged against the light colored limestone cliffs. Once your eyes adjust to the shadowed nooks and crevices of the cliff face, you immediately begin to see glistening needles attached to the limestone and entangling vines. Intact spire. A specimen of Mychostoma alba showing the young and fragile early spire whorls that eventually fall off in a process called “spire truncation”. Photo: Richard L. Goldberg. © 2012. Among these snails you can immediately see that some shells are “truncate”, while others have a shell that tapers to a sharp needle point spire. These latter shells are young snails, which have not yet truncated their early whorls. Over time they lose the early growth in a rough and tumble environment of karst rock, where heavy rains and a host of predators add to the precarious environment of these fragile snails. In fact, when plucking one of the youthful, sharply pointed snails from the limestone, the early whorls usually break off with nothing much more than blowing on the shell. The amazing aspect of this biological cycle is that without intervention, the snail can often retain the early whorls through adulthood. The moment the snail is disturbed, bumped or jostled, it loses its youthful shell structure. A living Jamaican Urocoptid, Apoma agnesiana, with a truncated spire. Length about 25mm. Photo: Richard L. Goldberg. © 1988. Is it simply the fragility of the shell that causes the shell to truncate, or is the snail dropping off a portion of its shell as a means of diversion to a potential predator? 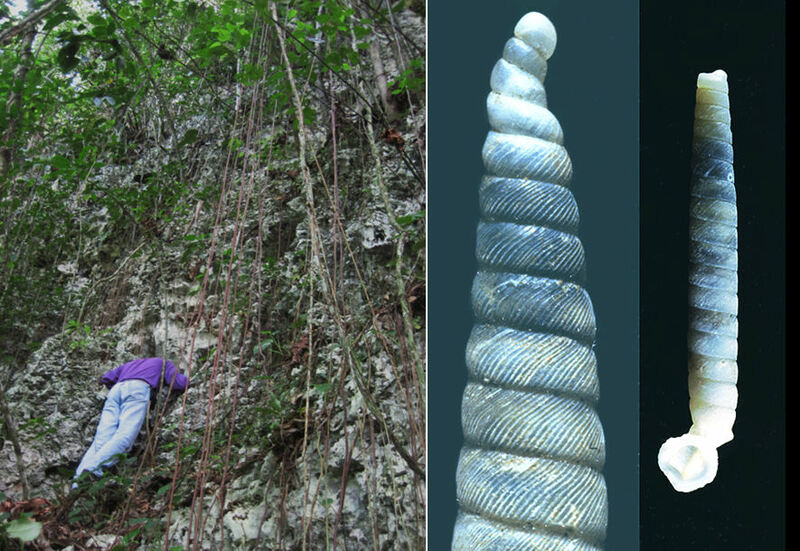 Left: High up on a limestone cliff face; habitat of Apoma agnesiana in Jamaica. Right: The early youthful spire whorls of A. agnesiana and an adult specimen showing spire truncation. The twist of the early spire whorls is natural in this species. Photos: left – Alan Gettleman. right – Richard L. Goldberg. © 2011. Some snail species actually drop off a portion of their fleshy foot when confronted with a predator in a process called automizing, where the snail leaves behind a portion of its foot for the predator while the snail escapes. It is one of the many fascinating processes found in nature, and in the case of snail spire truncation, one of many unanswered questions. Is a Urocoptid with a truncated spire a victim of youth lost?